Yesterday, we went to Rotterdam for the Wereld Haven Dagen (World Harbour festival) and we ended up having a drink at Hotel New York. The hotel was right in the middle of the festival grounds, and their terrace – overlooking the river – was crammed with lounging people. 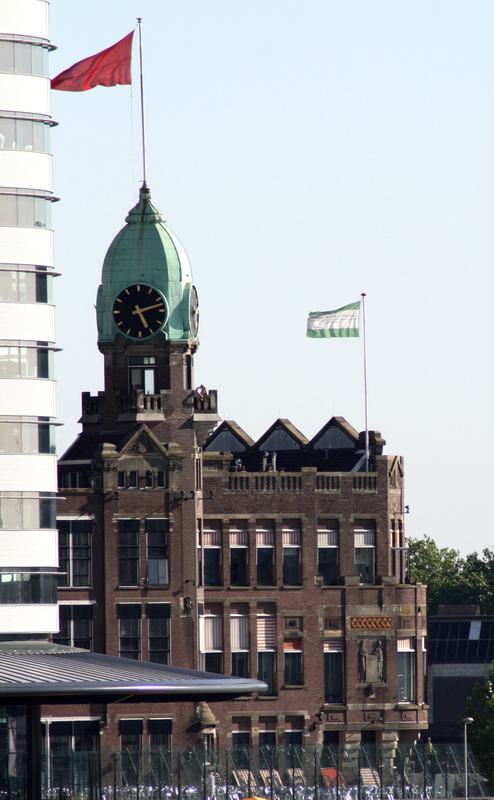 The beautiful Hotel is located at the waterfront, overlooking the Rotterdam Skyline. You should know that this part of Rotterdam harbour (called Wilhelmina Pier) is currently hot & happening. Skyscrapers have been built all around the hotel, and little taxi-boats are commute between Hotel New York and the quays across the river; the place is, once again, buzzing! Hotel New York is the place to be! For the information about the hotel I didn’t have to look far; it was all in the Hotel’s webpages. In earlier times, many Europeans escaped poverty and/or religious persecution by leaving from Rotterdam. These emigrants usually left for North America, hoping for a better life. In 1873 the Nederlandsch Amerikaanse Stoomvaart Maatschappij company was founded, officially renamed ‘Holland America Line’ in 1896. 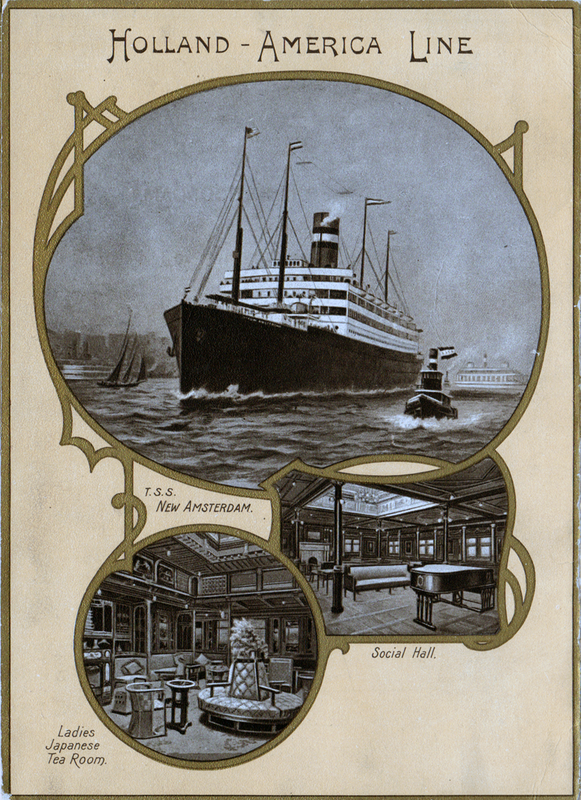 Emigrants embarked in Rotterdam in large numbers, most of them debarking in New York City on arrival in the ‘Promised Land’ of America. In 1971, after more than 100 years of transporting passengers, the Nieuw Amsterdam left the city on the Maas for its last crossing. 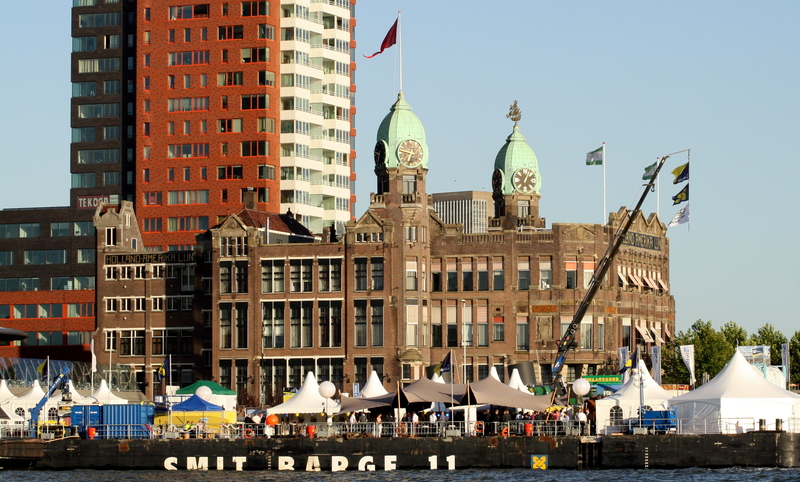 An important episode in Rotterdam’s nautical history had come to an end. Browsing the internet for old pictures of the Holland America Line building led me to some very interesting pages. 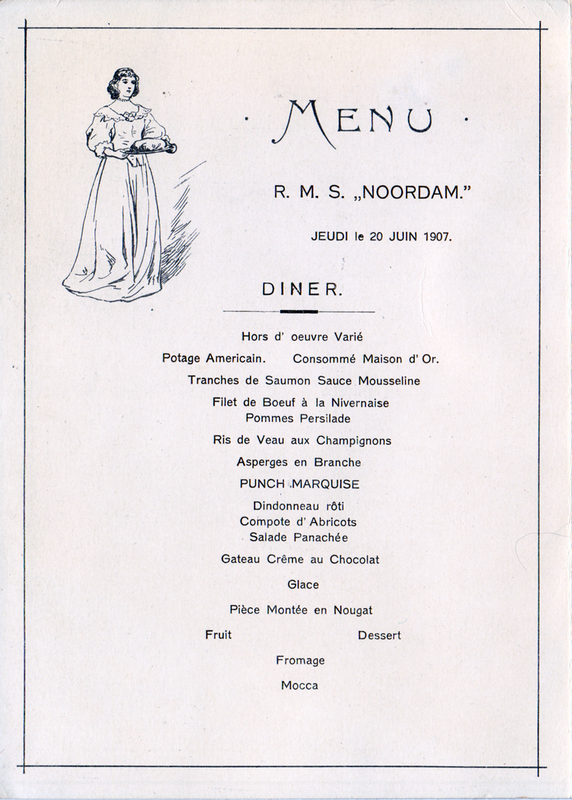 Initially, I was looking for old photo’s of the building, but I also found old menu’s, and passenger lists with Art Nouveau decorations on the cover! What a treasure that these documents have been saved and made digitally available to all of us! 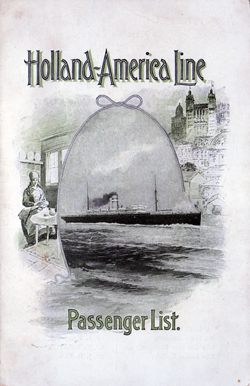 In the passenger list cover on the lower left, you can actually see the building that is now known as Hotel New York. And what do you know, in the second cover, there are pictures of the interior of one of the ships. I love the “Ladies Japanese Tea Room”, and the “Social Hall” with skylight. 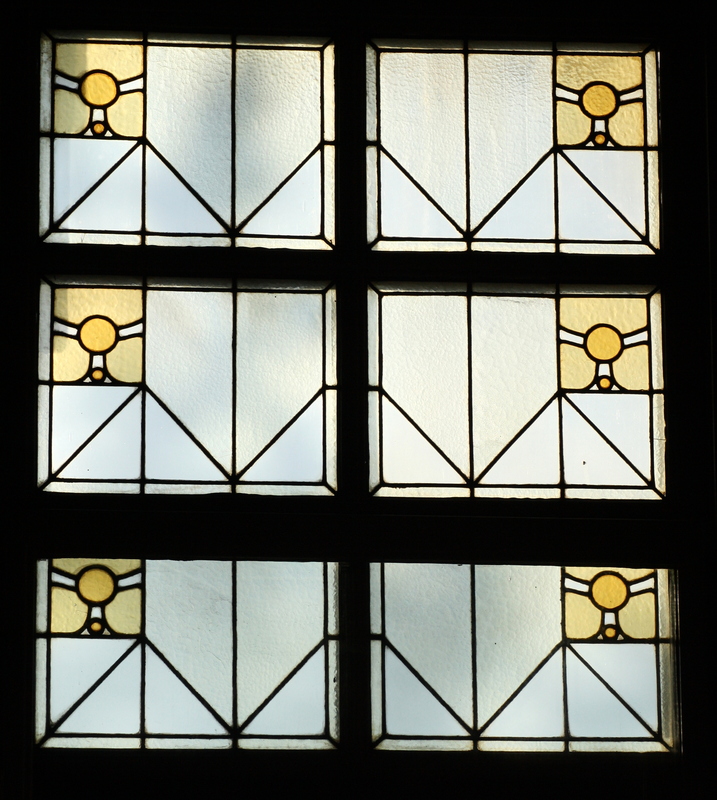 Wonderful to see that even on ships, designers included these very typical Art Nouveau features! 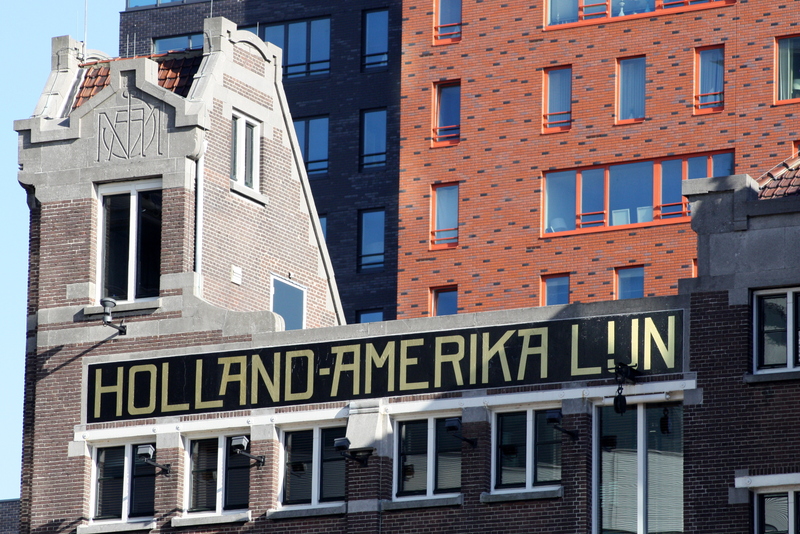 Hotel New York is situated in the beautiful former head office of the Holland America Line, also known as ‘The Grand Old Lady’. 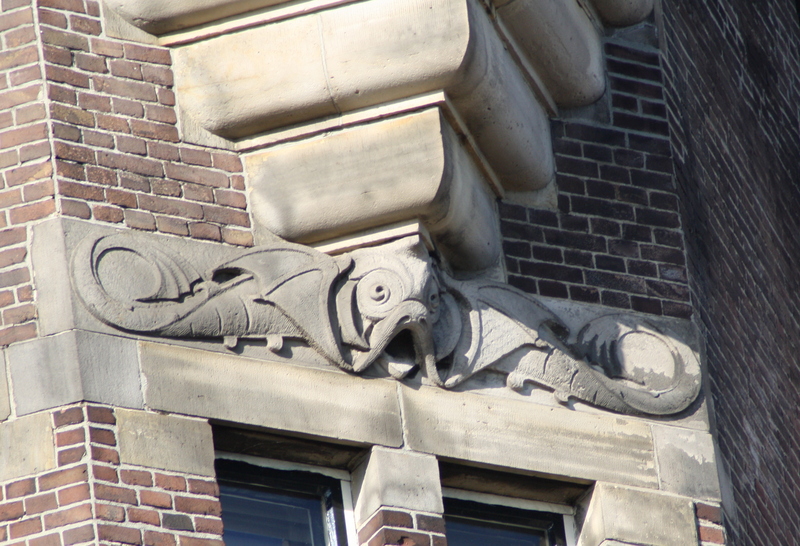 This office was built in the Jugendstil style in 1901 by the architects J. Muller, Droogleever Fortuin and C.B. van der Tak. In 1977 the Holland America Line’s head office moved to Seattle and in 1984 the building on Wilhelmina Pier was put on sale. One fine day in the early nineties, a few people regarded the building from across the water. With its tall towers and spinning weathercock, the building seemed to say: “Yes, I’m still here!” That is when the idea of a hotel and large café-restaurant on Wilhelmina Pier first took shape, leading to Hotel New York opening its doors on May 5, 1993. Rotterdam is a true metropolis, the skyline that gives the city its grand aspect being visible from afar. Thanks to the impressive architecture, marvellous shops, numerous festivals and events, museums and of course the city’s famous harbours there is lots to explore and experience. Rotterdam sizzles! See www.rotterdam.info for more information. Now, if I am not mistaken, “Anno 1916” is chiseled in these above stones. They are located on the right side of the building, high in the wall. But as the building was built in 1901 according to the current owners, I do not understand that date. I will have to do a lot more digging in the buildings history. In the mean time, if anyone knows the answer, please do not hesitate tell us the story! Very interesting indeed! Thanks for all those pictures. I went on an Alaska cruise two years ago on Holland America, and was more impressed than with another company ( just returned from Alaska today). 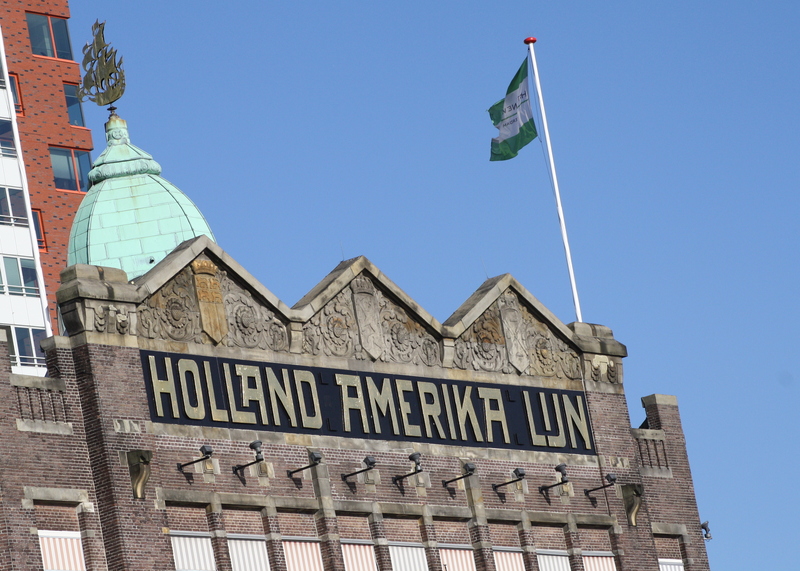 The history that talked about Holland America is therefore even more interesting to me. As to Art Nouveau you are really a great, great fan of art nouveau! I think the Japanese tea room may speak of the influence of Japanesr art that influenced the Impressionists and post impressionists, including van Gogh, a Dutch artist. I am very interested in this subject matter. Will continue to read your blog! Thanks for sharing. Thank you for your kind comments! I do indeed love Art Nouveau / Jugendstil very much! And, as I lived in Japan for a while, I also learned to love Japanese art. Now, with this blog, everythings falls into place! I am reading a lot, and learning new things every day! As I am Dutch, I am aware of van Goghs Japanese period, but I do not think they are his best works. I appreciate some other painters much more. In my previous post you can see a painting I particularly love, by Breitner. I will be paying extra attention to the Japanese details in Art Nouveau, so keep on reading! Hello, I am talking to a Dutch about Dutch artist! I am really lucky! I don’t know why your reply did not appear on my notifications. I just happened to look up your blog for your name and found your response. Much thanks! I also reblogged your art nouveau post because it is very interesting. In 1916, an octagonal tower was added to the building on the north-side, with a quadrilateral copper cupola. The cupola has a dial on all 4 sides as well as a flagpole in the middle to crown it. In 1920, a similar tower was added to the south-side of the building, with weather vanes on all 4 sides and a wind vane in the shape of a sailing ship crowning the top. Funny thing is, the “Anno 1916” stone was in the tower on the South-side! N.B. In 1993, the office building was (internally) renovated for the new use as Hotel New York.